Join us for the launch of GRID 2019: An urban perspective on Friday, 10 May 2019 at the Palais des Nations, Geneva. IDMC will be in Cannes on 15-16 April to join the first conference focused on the impacts of climate change on health. How many children are internally displaced across the world? How do they live? In our new blog post we discuss the urgent need to improve the collection and the use of data to protect children in displacement. What is internal displacement? Why should we care about it? Who is the Internal Displacement Monitoring Centre and what are they doing to address and help solve this issue? Our new paper estimates the fiscal gap that governments of countries affected by internal displacement may face because of future displacement crises. IDMC and partners convene meeting in Fiji to launch new project which aims to prevent and respond to the risk of displacement associated with disasters and climate change in the Pacific island states. View and interact with near real-time updates of situations of internal displacement on desktop. 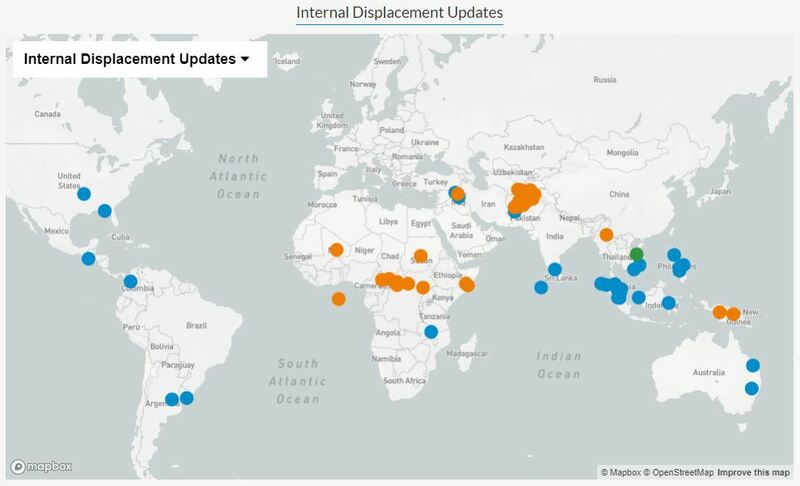 This map displays all displacement events recorded by IDMC that have occurred in the past six months.